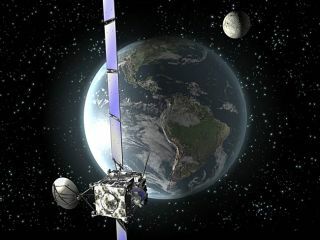 An artist's rendition of Rosetta's second close approach to Earth on Nov. 13, 2007. The swing-by is Rosetta's third major step on its 10-year journey to comet 67/P-Churyumov-Gerasimenko. The MinorPlanet Center, the world clearinghouse for information about newly discoveredasteroids, raised the alarm last week. In an email to professionalobservatories, they announced that a previously unknown asteroid would miss theEarth by just 5,600 kilometers. The newly discovered space rock was given an official labelby the MPC, which is run by the Smithsonian Astrophysical Observatory, Massachusetts, for the International Astronomical Union. Observations for 2007 VN84 werecollected from astronomers around the world, to track the threatening celestialbody. This would be one of the closest approaches ever by a sizable asteroid – its distance away being less than half the diameter of the Earth. Then Denis Denisenko, of Moscow's Space Research Institute(IKI), made an interesting discovery. He noticed that the incoming asteroid'strack matched that of the European space probe Rosettaon a scheduled flyby of Earth. The Rosetta craft was launched from Europe's Guiana Space Center in early March of 2004; the purpose of the space probe is to placeitself in low orbit around the comet Churyumov-Gerasimenko at a distance of 675million kilometers from the sun. To get there, the billion-dollar craft willspend ten years boosting its velocity (using the gravityassist technique) with no fewer than three flybys of Earth and one of Mars. Denisenko's discovery came none too soon; Britain's Royal Astronomical Society was preparing a bulletin for the media that would havebeen released on Monday. The minor planet 2007 VN84 does not exist and thedesignation is to be retired. Thisincident, along with previous NEOCP postings of the WMAP spacecraft, highlightsthe deplorable state of availability of positional information on distantartificial objects (whether in earth orbit or in solar orbit). The DistantArtificial Satellites Observations (DASO) page lists a number of such objects,but has to be updated on a fairly regular basis from five different sources anddata is not always available for the timespans needed. A single source for informationon all distant artificial objects would be very desirable. Via 'Deadly asteroid' is a space probe; take a look at the MinorPlanet Electronic Circular that cleared things up.